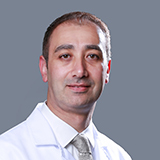 Dr. Ala Eldin Farasin is German board certified consultant interventional cardiologist. He has obtained his Medical Education from Medical School at University of Heidelberg, Germany, German board in Cardiology & German board in Angiology, internal medicine. He has gained extensive trainings in advanced interventional cardiology, training in ICD therapy including CRT, pacemaker therapy and technical qualification in rescue service, echocardiography and radiation protection course. His previous experience includes Section leader of invasive cardiology at Diakonissenkrankenhaus- Deaconess Hospital in Mannheim, Germany. His core competency includes management of cardiac catheterization laboratory, implementation of coronary interventions and interventions in structural heart diseases, methods like PTA, Stenting, pacemaker and ICD therapy, emergency care for heart stroke patients and angiology. He has performed more than 6000 coronary interventions and extensive experience in valvuloplasty, PFO and LAA occlusion. He has specialized skills in interventional angiology and have performed 1000 interventional angiology procedures such as illiacal, femoral, renal as well as carotid stenting using innovative methods and has got vast experience in intensive care. He also possess huge experience in below the knee intervention and managing diabetic patients. His areas of interest are interventional cardiology, angiology, ICD, pacemaker implants and emergency care for heart stroke patients. Dr. Ala can speak fluent English, Arabic and German.